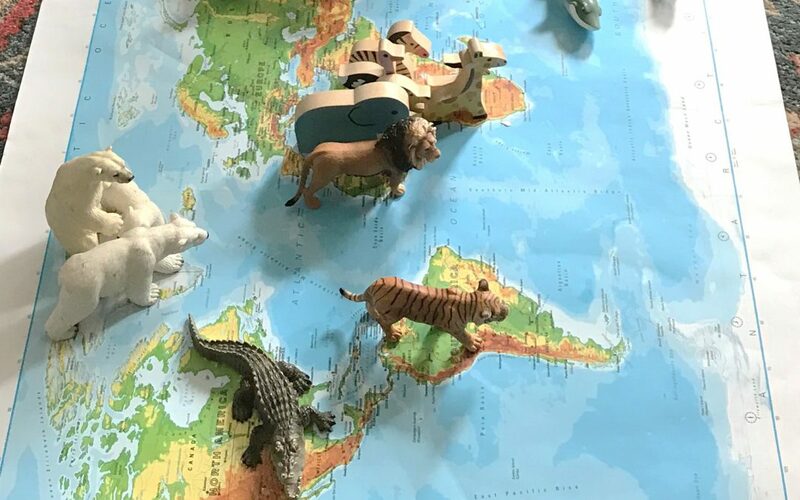 Use your animal puppets to learn about the world! Tomi and Mimi happen to have a lot of animal puppets. Animals from all over the world; Polar bear, ostrich, zebra, koala, penguins, dogs, cows, even lions, tigers and a hippopotamus. Every morning they learn about the world, the continents and the countries. Usually with a globe or with a map. Today Tomi and Mimi learned about the animals in different parts of the world. Because there are no polar bears in the desert and no zebras in North America. China is famous for its pandas and Australia is known for its kangaroos. So Tomi and Mimi collected all their animal puppets and try to place them in the matching parts of the world. It was a fun thing to do. Maybe you have a map at home too and some animal puppets to put on it. Otherwise you can ask your parents or another grown up to print some animals for you to cut out. If you like animals, you will love Tomi and Mimi animal yoga app! There is a little rhyme about each animal and you can join them to do funny poses. Use this link to download. Tomi and Mimi love animals and they love to learn about the world. We hope you have fun doing this little exercise game too. Happy learning. See you next time!